The bot use web-request to down load single file from any web-server. 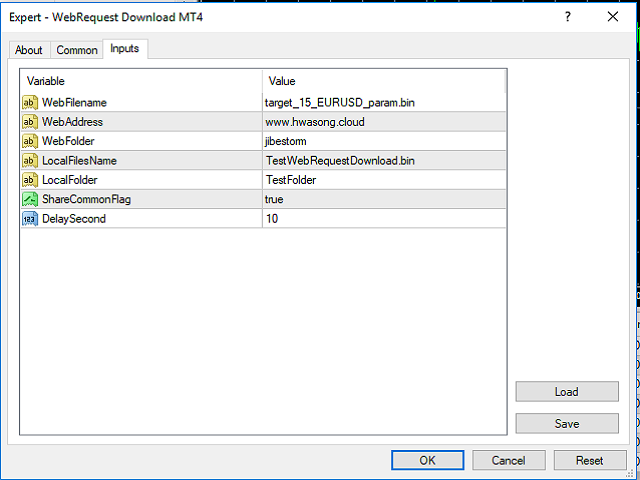 It connect web-site using a web-socket and download into a selected folder in MetaTrader 5. User can select whether a common directory or a data directory of the MetaTrader 5. When run in a single computer or VPS the bot will always update files continuously. It is working with one-way synchronizing of single file. It has an option to create the local sub-directory and locale file name. The bot allow to set the source-file directory to point a source-file in web-server. The bot will fulfil the idea into continuous update the running others trading bot's parameter or data as the need. The bot can run with a Private Copy Trade MT5, and download a data binary file from web-server into share-common directory. Private Copy Trade MT5 then can perform with VPS.